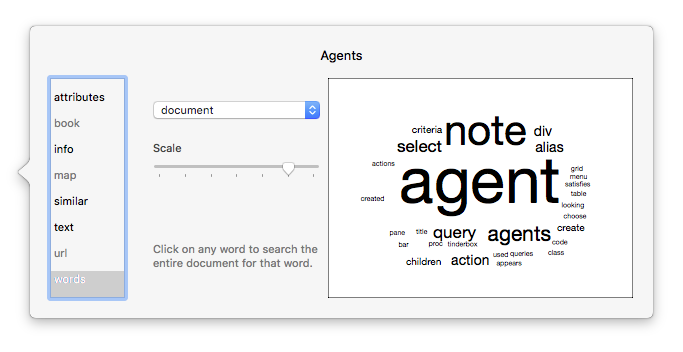 How do I create a Word Cloud from a TB document? (It's not yet in aTbRef but will be soon). If you right click the white word-count area and use the 'copy' option that image is copied to the Mac's clipboard and can be used as an image. If you use the data to create a document in Preview (or a vector image editing app) you can actually access and manipulate the text. An older solution is to use the ^documentCloud^ export code. Note however that whilst this creates text as different sizes it doesn't do the 'cloud' layout element of the task. I'd use the Get Info method. Mark A. -- what do you mean by "white word-count area" ... I seem to be able to right-click all over this dialogue-window to invoke the "copy"-option ... but nothing seems to be transferred to the Clipboard. I believe you'll find an image is placed on the clipboard, which you can paste into an image editing program. The 'white word-count area' is the white bordered panel at the right of the pop-up (as illustrated in a previous post). The panel shows a word cloud within it. You right click that and press copy. Then open an editor - Preview will do and use the 'new -> from clipboard option. 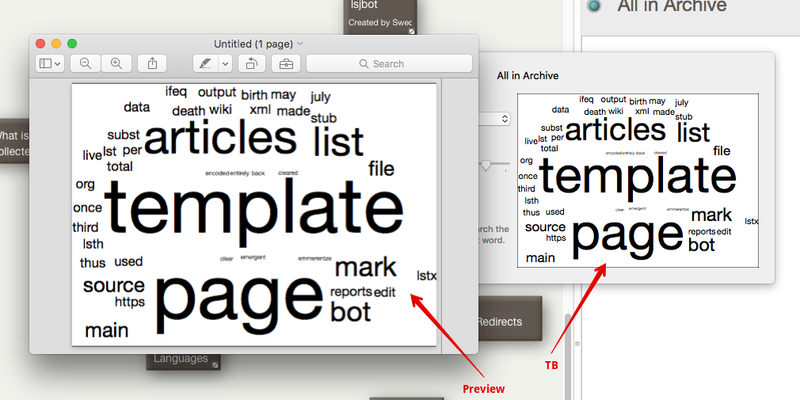 Or, make a new blank image and paste in the word cloud image data from the clipboard. Just don't copy anything to your clipboard between clicking 'copy' in Tinderbox and pasting into the doc n your image editor. There is no option to save the data as a file, which is what I think you are expecting. If you don't have an image editor, don't worry, Mac Preview is perfectly good for making a PNG from the copied data. Thanks, Mark A., for getting back on this. I right clicked the cloud in Get Info, selected copy, opened Preview and made a new image (shown) from the clipboard. It works here, too. There is a well-known bug in OS X that occasionally fouls up the clipboard; if that's your problem, a restart will cure what ails you. Mark & Mark -- I tried all of your suggestions ... but to no avail. "New from Clipboard" remains greyed out. I read something about deleting com.apple.screencapture.plist in /Library/Preferences but there happens to be no such file in either the suggested or any other directory. For the time being I'll stick to shift+ctrl+cmd+4 in order to clip the screenshot to the Clipboard and then paste it with "New from Clipboard" to Preview.app since doing it this way "New from Clipboard" is available in Preview.app. Just tested again, and it works fine here. Right click ▸ Copy and then Preview: New from Clipboard.